Custom Ribbon- 2" X 8"
Custom Ribbon- 2" X 4"
Custom Ribbon- 3" X 10"
Custom Ribbon- 2" X 12"
Custom Ribbon- 2" X 10"
Badge Satin Ribbon 1 1/2"
Custom Ribbon- 3" X 8"
Custom Ribbon- 3" X 12"
Full Color Ribbon - 2" x 4"
Full Color Ribbon - 2" x 6"
Full Color Ribbon - 2" x 10"
About this 1-1/2 Natural Wood Wooden Nickel:Natural wood finish. Classic promotional item 21 stock designs.The consistency of the quality of the imprint can not be guaranteed due to the print method & the natural absorption in the end grain of the raw wood. Typeset copy must be 10pt. or larger. Factory will not be responsible for coverage of detailed logos & small type.Special Instructions:For custom imprint on 2 sides, add change of copy charge. Please Call for Service. About this Laurel Wreath Medal:Award your 1st, 2nd and 3rd place winners with these stunning medals, adorned with wreaths of excellence! Available in gold, silver and bronze. Perfect for 1st, 2nd and 3rd place. Includes red, white, and blue ribbon and quick clip hook. Optional black ribbon available; please specify. Materials: Varies: Zinc, Aluminum, Magnesium and Copper.Special Instructions:Rush Service:The standard imprint method, 1-color/ 1-location is available. About this Ribbon 5/8:These colorful ribbons with your imprinted logo or message will enhance any package. Single face satin. 100% polyester. Step and repeat. About this Plastic Token:Durable plastic.Classic promotional item.21 stock designs.7 colors available.Special Instructions:For custom imprint on 2 sides, add change of copy charge. Please Call for Service. About this Plastic Token, Full Color Digital:Durable plastic.Classic promotional item. About this Ribbon 7/8:These colorful ribbons with your imprinted logo or message will enhance any package. Single face satin. 100% polyester. Step and repeat. About this Bargain Round Token:Made in USA. About this Junior Round Token:Made in USA. About this Giant Round Token:Made in USA. About this Custom Ribbon - 2 X 8:This always economical ribbon is an effective way to communicate your message!Classic award ribbon with a pinked top and bottom. About this 1 1/2 Dye - Sublimated Satin Ribbon:Here's a marketing tool to "tie around" your campaign. Choose this 1 1/2" dye-sublimated satin ribbon spool. Add your logo to this product for an excellent opportunity to start promoting your business.Pair this ribbon as decoration around your favorite Holiday Gift set to complete the perfect look; or tie the ribbon around a promotional gift and hand out to deserving clients and employees. Price is per spool with 50 yards in a spool.Dye-sublimation is a CMYK printing process. PMS colors that are called out will be matched as close as possible. Exact PMS or CMYK color match not available. For BEST results, supply vector artwork and call out PMS - Solid Coated colors. Art files that are submitted as bitmap, jpg or files with gradients cannot be printed with PMS values. About this Small Square Token:Made in USA. About this Custom Ribbon - 2 X 4:This always economical ribbon is an effective way to communicate your message!Classic award ribbon with a pinked top and bottom. About this Stop Sign Shape Token:Stop Sign shape ideal for safety programs or stop crime promotions.Made in USA.These traffic sign shaped tokens are great for promotions from the highway department, state highway patrol, police departments, and school districts. About this Custom Ribbon - 3 X 6:This always economical ribbon is an effective way to communicate your message!Classic award ribbon with a pinked top and bottom. About this 7/8 Dye - Sublimated Ribbon:Choose a fun "spin" to put on your company's marketing campaign with this spooled 7/8" dye-sublimated satin ribbon. Use it as decoration around the office, tradeshows; or tie the ribbon around a gift and hand out to deserving clients and employees. This ribbon is sure to catch attention. Price is per spool with 50 yards in a spool.Dye-sublimation is a CMYK printing process. PMS colors that are called out will be matched as close as possible. Exact PMS or CMYK color match not available. For BEST results, supply vector artwork and call out PMS - Solid Coated colors. Art files that are submitted as bitmap, jpg or files with gradients cannot be printed with PMS values. About this Custom Ribbon - 3 X 10:This always economical ribbon is an effective way to communicate your message!Classic award ribbon with a pinked top and bottom. About this Custom Ribbon - 2 X 6:This always economical ribbon is an effective way to communicate your message!Classic award ribbon with a pinked top and bottom. About this 4 x 1.625 Badge Ribbon:Add our new badge ribbon to recognize special guests at your event. With several ribbon and foil colors available you'll be on brand at the conference. About this Custom Ribbon - 2 X 12:This always economical ribbon is an effective way to communicate your message!Classic award ribbon with a pinked top and bottom. About this Custom Ribbon - 2 X 10:This always economical ribbon is an effective way to communicate your message!Classic award ribbon with a pinked top and bottom. About this Full Color Ribbon - 2 x 8:Our full color ribbon is customized any way you wish and your message is visible for all to see.These colorful ribbons are perfect to promote your event, school, club, nonprofit organization, sports team, and more! About this Full Color Awareness Ribbon with Pin:The Full Color Awareness Ribbon with Pin is a full Sublimation-dyed ribbon that is Made in the USA. The 5/8" wide ribbon includes secured pin accessory on back for easy and secure attachment to apparel, bags, or other accessories. Show support for any cause. Material: Polyester. About this 5/8 Dye - Sublimated Ribbon:This is a fun way to decorate your company's marketing campaign. This 5/8" dye-sublimated satin ribbon spool is a wonderful decoration around the office or during tradeshows; or tie the ribbon around a gift and hand out to deserving clients and employees. Price is per spool with 50 yards in a spool.Dye-sublimation is a CMYK printing process. PMS colors that are called out will be matched as close as possible. Exact PMS or CMYK color match not available. For BEST results, supply vector artwork and call out PMS - Solid Coated colors. Art files that are submitted as bitmap, jpg or files with gradients cannot be printed with PMS values. About this Custom Ribbon - 3 X 8:This always economical ribbon is an effective way to communicate your message!Classic award ribbon with a pinked top and bottom. About this Custom Ribbon - 3 X 12:This always economical ribbon is an effective way to communicate your message!Classic award ribbon with a pinked top and bottom. About this Custom Ribbon - 1 5/8 X 6 1/2:This always economical ribbon is an effective way to communicate your message!Classic award ribbon with a pinked top and bottom. About this Full Color Ribbon - 2 x 4:Our full color ribbon is customized any way you wish and your message is visible for all to see.These colorful ribbons are perfect to promote your event, school, club, nonprofit organization, sports team, and more! About this Full Color Ribbon - 2 x 6:Our full color ribbon is customized any way you wish and your message is visible for all to see.These colorful ribbons are perfect to promote your event, school, club, nonprofit organization, sports team, and more! About this Full Color Ribbon - 2 x 10:Our full color ribbon is customized any way you wish and your message is visible for all to see.These colorful ribbons are perfect to promote your event, school, club, nonprofit organization, sports team, and more! Thank you Mindy, Owen and Alexis for your positive reviews on our promotional Wooden Nickel. This item is our #1 top seller in our awards selection. The Wooden Nickel is a great promotional item for any company. It can be used as a decoration for tables or given to customers as an award! Wooden nickels make great coupons. Use your logo or ad copy on side one. Complete your winning promotions with one of our 21 stock designs on side two. Please note that sides 1 and 2 do not register. Stock Design Available, Please Call for Service. Thank you Heather and Rylee for your reviews. We’re glad to read your feedback on our promotional Bargain Round Token. We know it’s popular with many customers. The Bargain Round Token could be used for table decoration or a collecting item for your customers. This unique promotional item will have your customers carrying these in their pockets or purse! Optional bead chain or split ring attached is available. Clear Coating Protective Overlay Option Available. Thank you William and Isaiah for your reviews. We are glad to read how well our wooden nickels are. 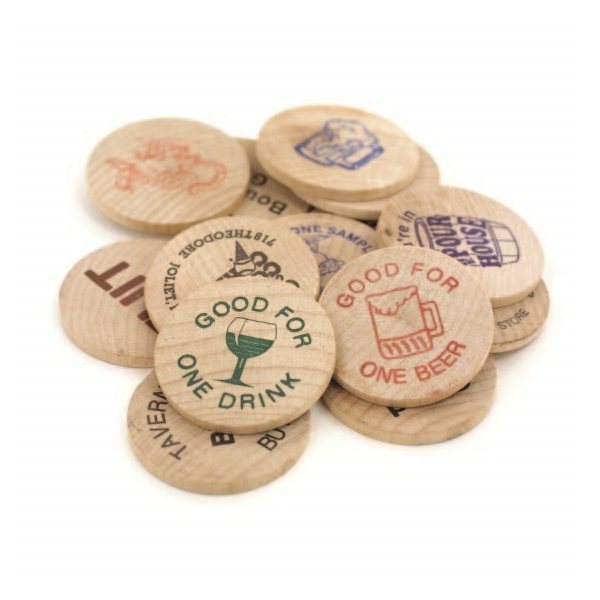 Wooden nickels are fun to decorate special events or hand out to customers as a souvenir. This fun design will have your customers remembering your company name! Order your 1-1/2” Natural Wood Wooden Nickel here. In our selection of promotional medals & ribbons, you’ll have no problem finding the perfect option for your marketing needs. We have wooden nickels, wreath medals, tokens, ribbons of different styles and colors, and more! Medals and Ribbons products are easiest when it comes to recognizing a bigger group. Let your customers, guests, athletes, employees, etc. feel important with a promotional medal or ribbon. Promotional medals and ribbons are great for any event! Recognize all your recipients with a promotional medal or ribbon from our selection. Look through our selection of medals and ribbons. Shop here! Here at AnyPromo, we always aim to make your event a huge success! Search our medals and ribbons selection to find what best fits your promotional needs. Medals and Ribbons are perfect for recognition. You’ll always get a smile when awarding a customer with a medal or ribbon. We have different types of medals and ribbons available in our selection. Make your event memorable with a medal or ribbon. Below you’ll find a list of some of our trending promotional medals and ribbons. Every item is available and waiting for you to order. Full Color Ribbon - 2" x 12"
Bridal Satin Ribbon -1 1/2"
Promotional medals and ribbons are more convenient to give as an award for bigger groups. Give each and every person an award with our high quality and affordable medals and ribbons. Have any questions regarding our promotional medals and ribbons selection? Live chat with one of our customer service representatives to help answer all your questions. They are standing by ready to help you! Our featured list of medals and ribbons are trending in this category. You won’t want to miss out on checking these options!